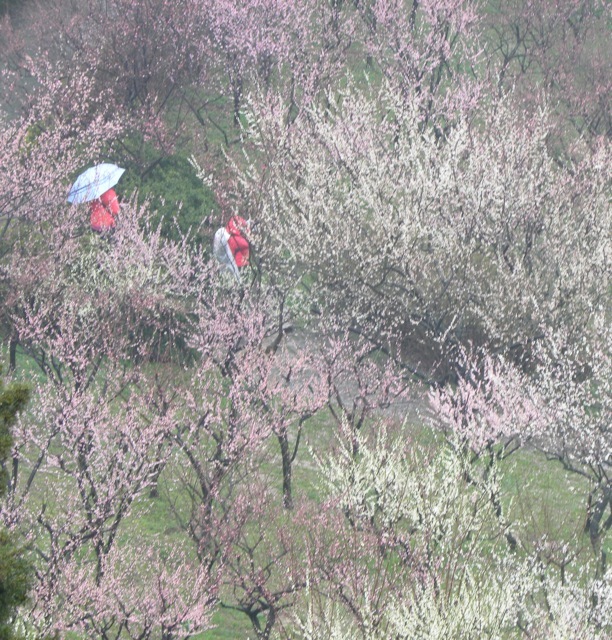 The weather in East China in early Spring is chilly and wet, but that’s the weather when the plum trees blossom. After many years of missing the flowering seasons, we finally went to East China early this year to view the plum flowers. 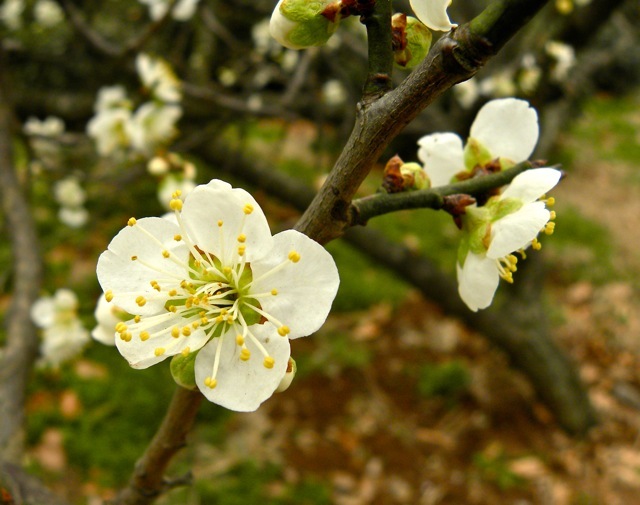 Plum flowers are hardy. They sprout shortly after the dead of winter, and are some of the first flowers to bloom. 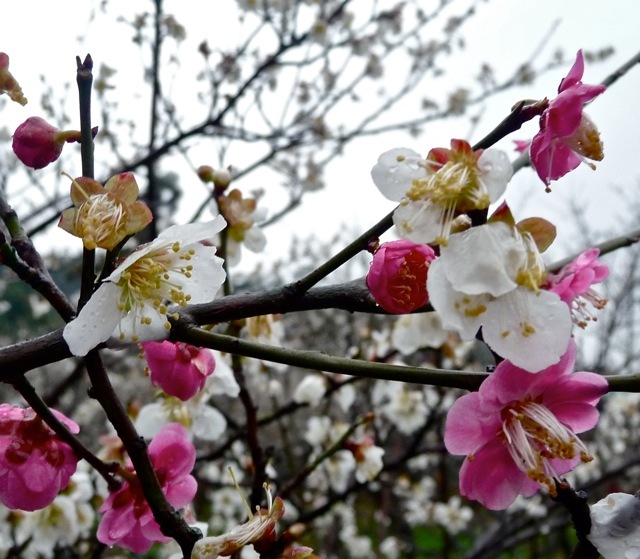 Chinese culture particularly admire the plum blossoms, citing their virtue of succeeding under duress, being beautiful in stark environment, and blooming alone while other plants shiver in the harsh cold. 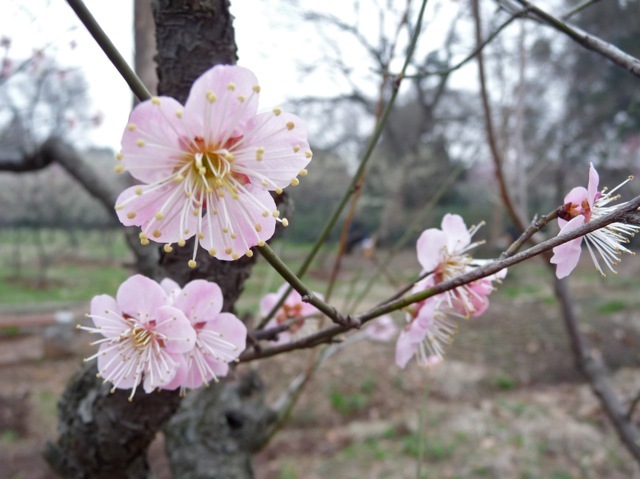 The plum flowers became the symbol of Spring, and the Republic of China government adopted it as China’s national flower. 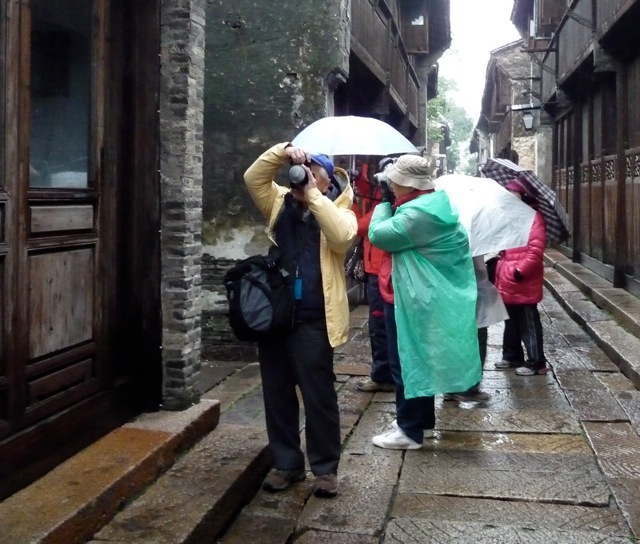 Sally and I took a tour with photography enthusiasts to Nanjing (南京), Yangzhou (揚州), Suzhou (蘇州), and Hangzhou (杭州). 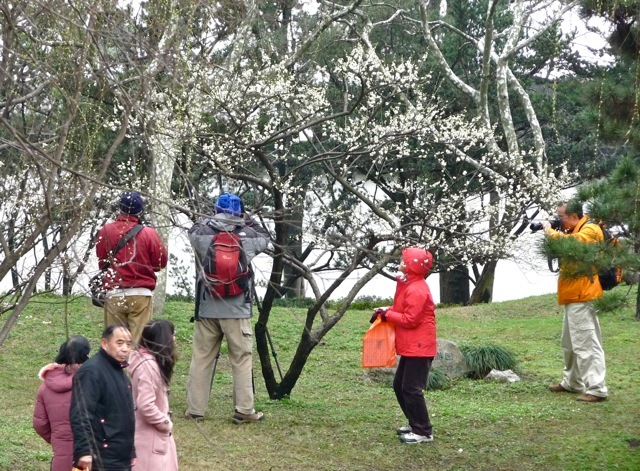 Unlike ordinary tour groups, this group went primarily to plum flower-filled hill, gardens, plantations, and parks. We were fully satisfied with our opportunity to take pictures of plum flowers. There are many kinds of plum flowers. Their names are 紅梅, 朱砂紅梅, 墨梅, 杏梅, 美人梅, 綠梅, 玉蝶梅, 垂梅, 臘梅 etc. Their colors and shapes vary and make our visit a fascinating tour of colors. 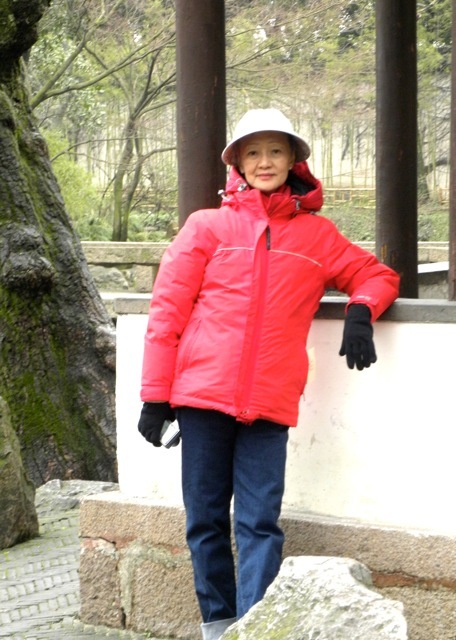 In Nanjing, we visited the Plum Hill (梅花山) where thousands of plum trees were planted. The flowers were in full bloom, and the weather was overcast and chilly. 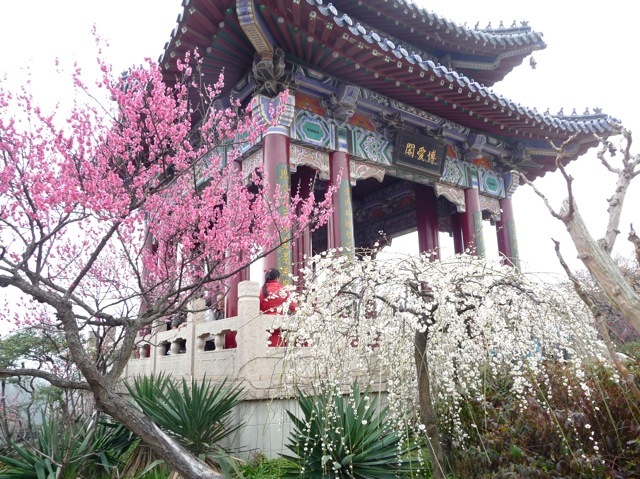 Pavilion framed by crimson (朱砂紅梅) plum flowers. 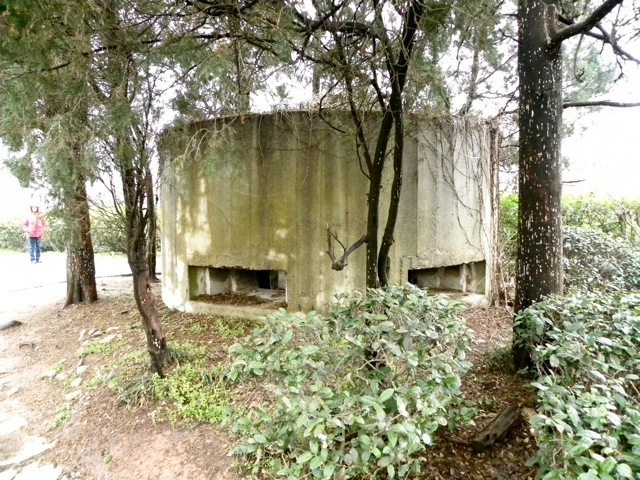 A machine gun pill box to defend Nanjing from the Japanese is one military relic on top of beautiful Plum Hill. 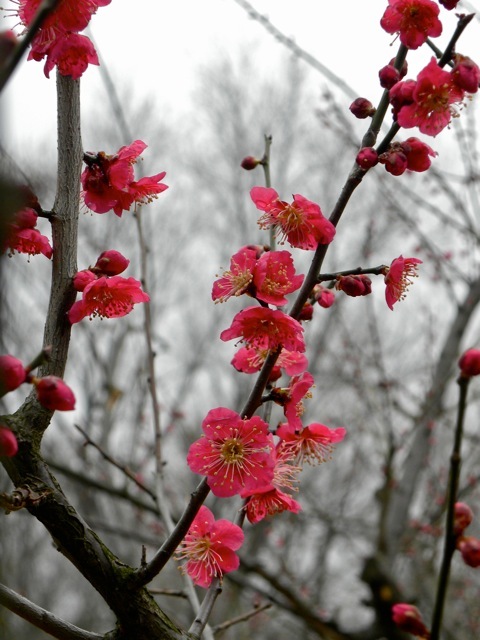 Crimson (朱砂紅梅) plum flowers on branches. This scene is a favorite topic of Chinese painting and it signifies Spring. 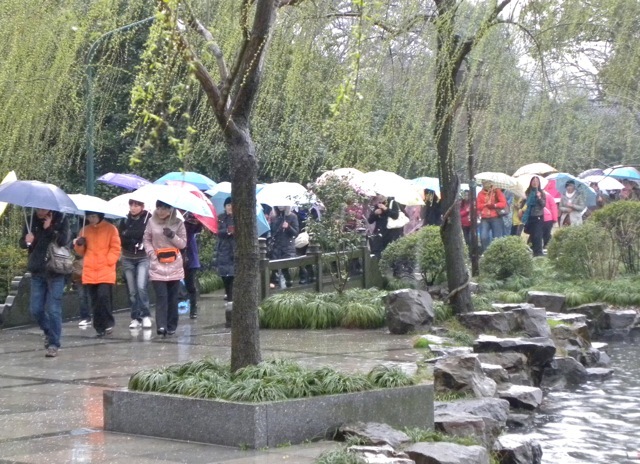 We also visited the 香雪海 Garden in the rain. Our tour mates were not deterred by a few drops of rain and took thousands of pictures. 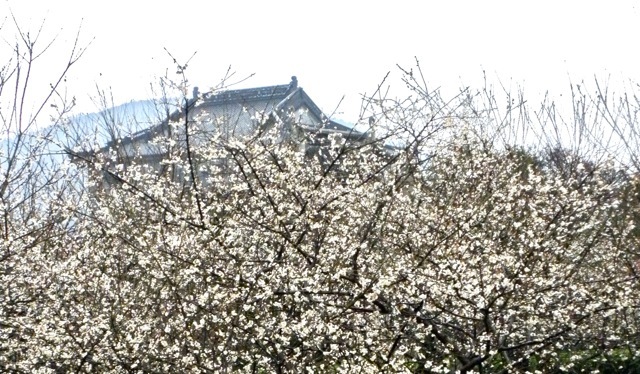 In the 香雪海 (Fragrant Sea of Snow) Garden, the white (玉蝶梅) plum flowers look like a blanket of snow. One hotel we stayed in advertised itself as a 5-star hotel. The lobby was grand, but it provided no heat. We shivered through the night under two blankets. The hotel was so poorly run they did not have knives for our use at breakfast. 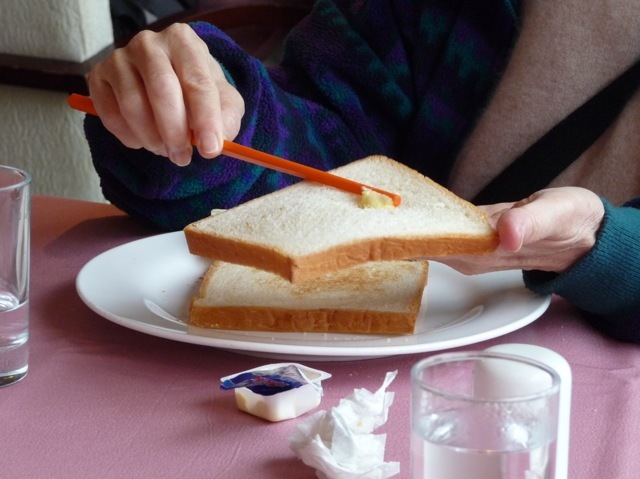 I had to use a chopstick to spread butter on my bread. In Yangzhou city (揚州), we visited the Lean West Lake (瘦西湖). 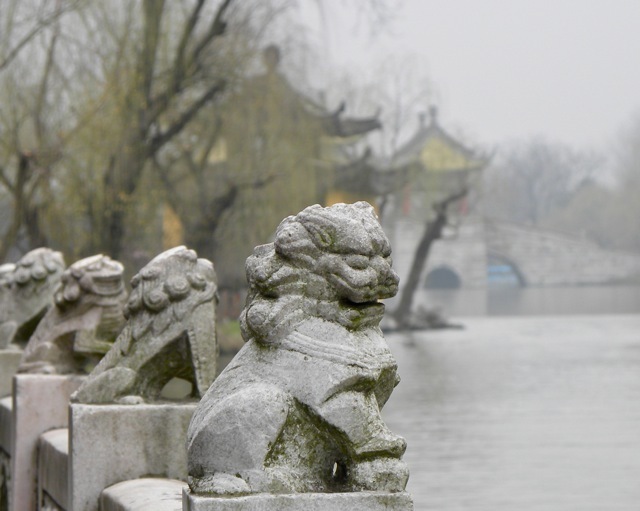 It is so named for its narrow shape, and to distinguish it from the West Lake (西湖) of Hangzhou. It is much prettier and enjoyable than the West Lake. 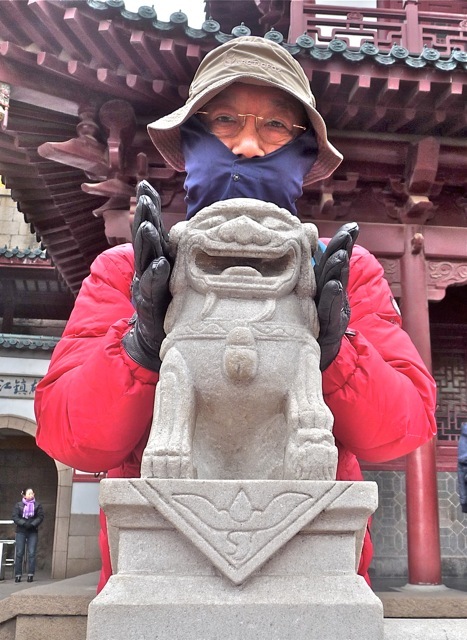 I love Chinese stone lions for their cute expressions and life-like postures. I found a laughing lion in a temple. I was covered from the cold; and I covered its ears to shield it from hearing dirty jokes. ﻿There was a cat playing with a pebble and kept itself busy and athletic. 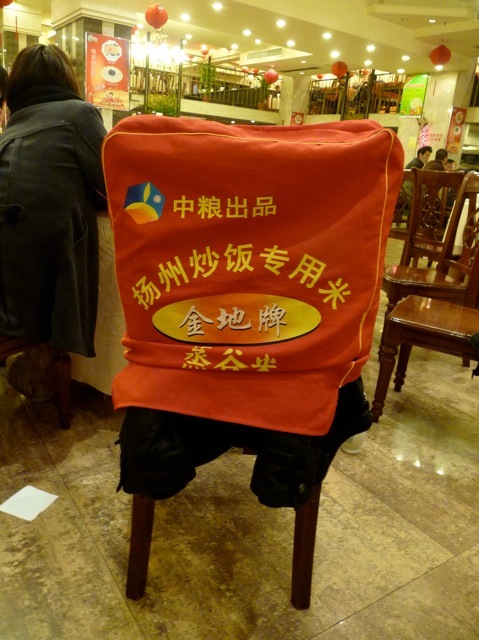 Few people know it, but Yangzhou fried rice (揚州炒飯) did not originate in Yangzhou. So for a brand of rice in Yangzhou claiming to be the official rice to be used for Yangzhou fried rice, it is a false and misleading claim. We visited the Plum Garden (梅園) in the city of WuXi (無錫). It was raining hard and the flowers were soaking wet. But that did not dampen the enthusiasm of the diehard photographers. One rain soaked branch with water droplets hanging onto plum flowers. 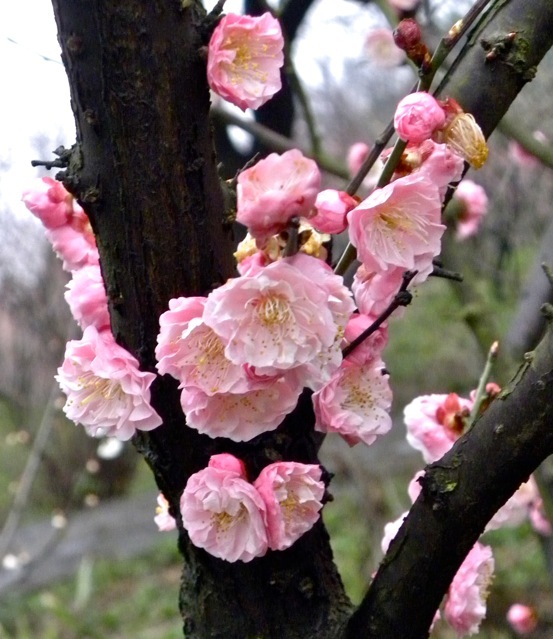 After the rain, new flowers would blossom within a day or two, revitalizing the plum trees to their glory. 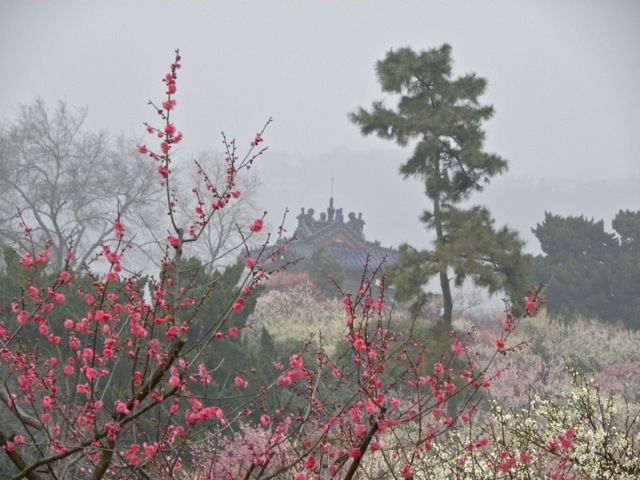 Crimson (朱砂紅梅) and white (玉蝶梅) plum flowers on the same tree. In this garden, a cat approached me, rubbed itself on me, and claimed me as its pet. 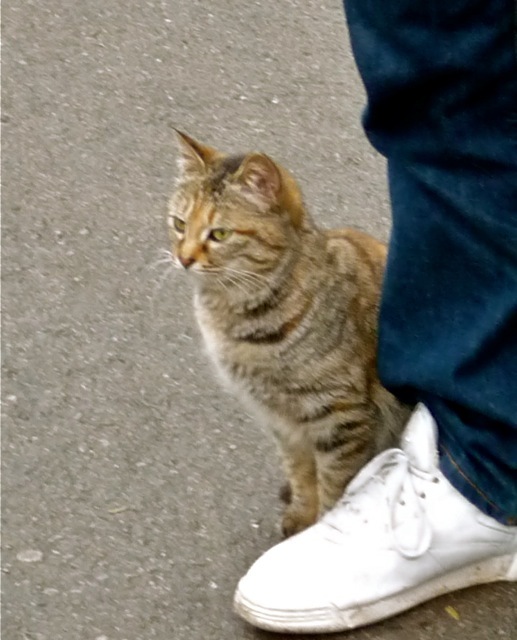 When another tourist tried to entice it, it chose to stay with me. 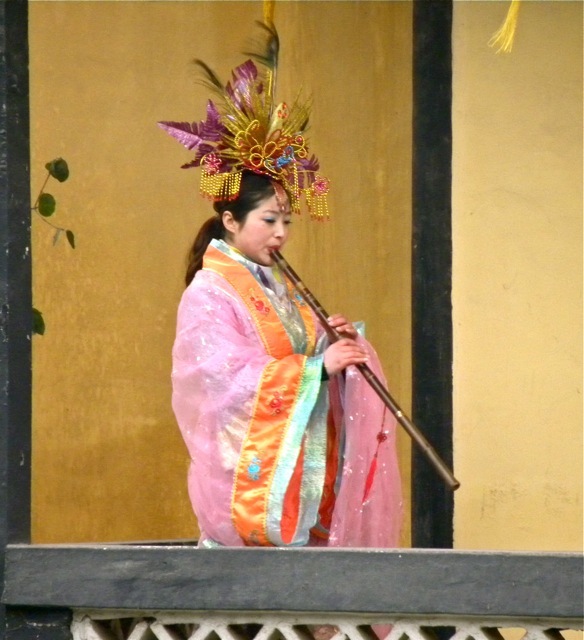 By Lake Tai (太湖), a girl dressed in a beautiful traditional hanfu played flute to enhance the Chinese cultural atmosphere. We visited the new Suzhou Museum designed by I. M. Pei. 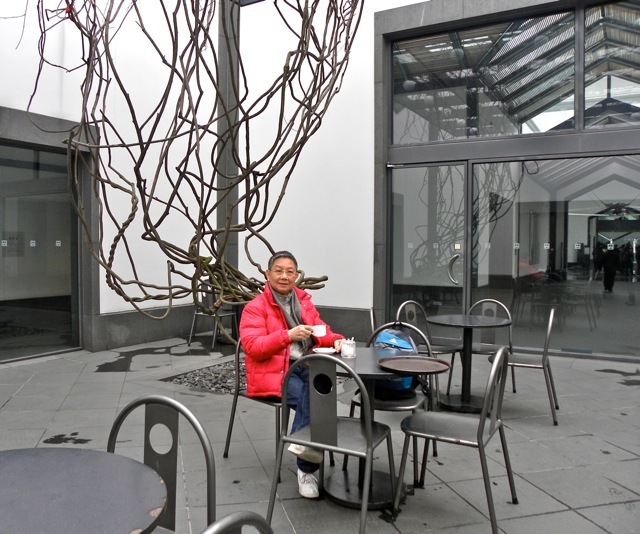 I enjoyed a delicious cup of coffee in the atrium cafe of the museum. Unscrupulous merchants invent non-existent items to entice gullible customers. 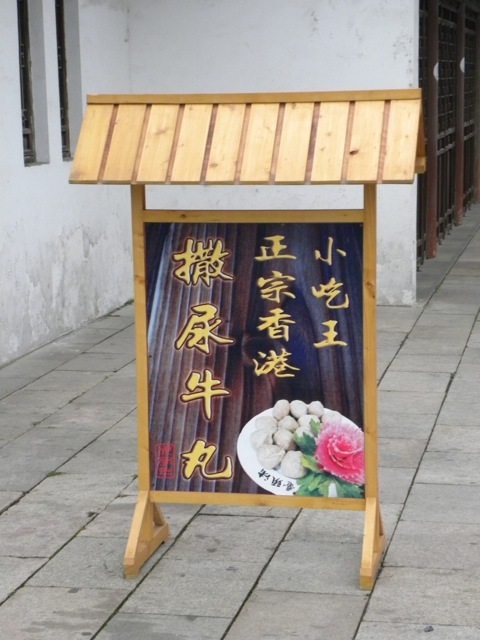 One restaurant advertised it sold “authentic Hong Kong ‘urination’ beef balls”. No such food exists in Hong Kong, so this is neither a Hong Kong food nor authentic. 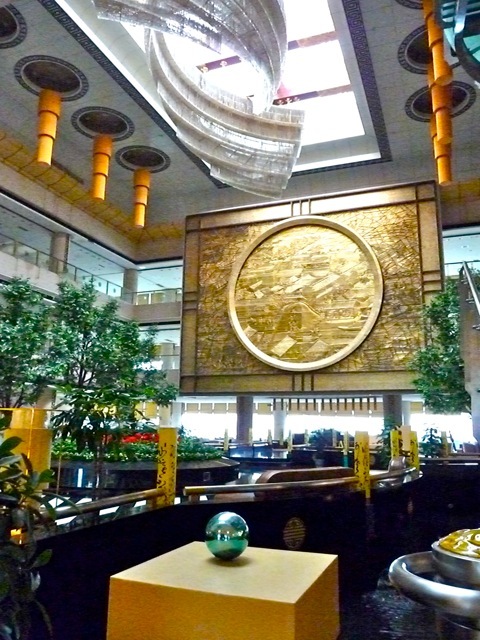 Chinese aesthetic value natural rocks that are fancifully shaped and/or textured. Really good ones can sell for thousands of dollars. 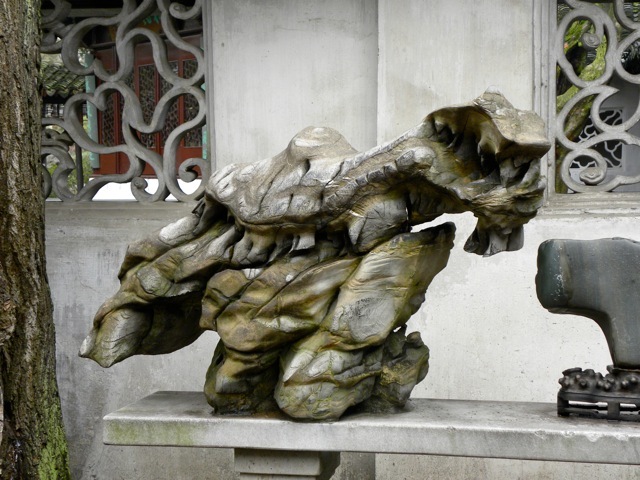 This one in a Suzhou garden mimics a man doing taichi and should have costed a good penny. 拙政園) was beautiful and serene. Sally enjoyed it and was affected by its ambience. 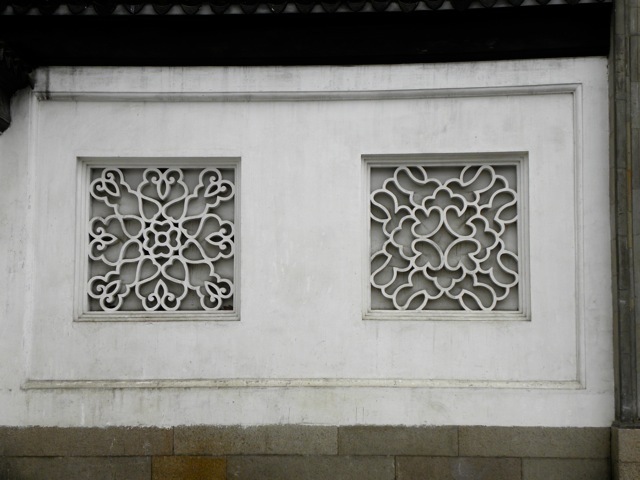 This garden used different masonry patterns for each of its dozens of wall windows. These two are just two of the many artfully designed window patterns. This garden had only a few plum trees. 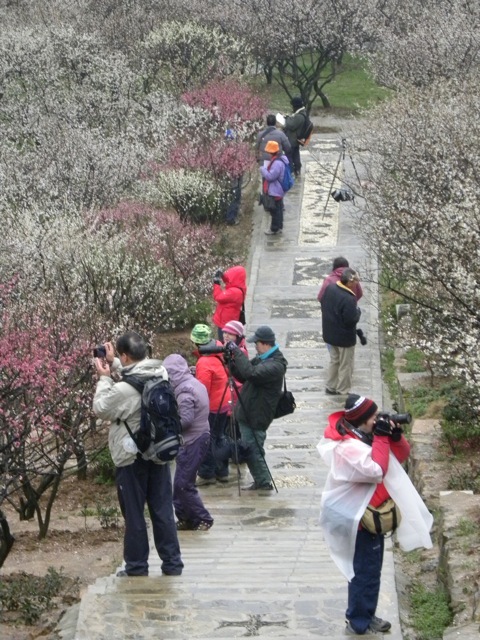 Our tour group did not miss any opportunity to take pictures of plum flowers. Local tourists were probably wondering what was so attractive about this twig of a plum tree. We visited old towns built among canals. 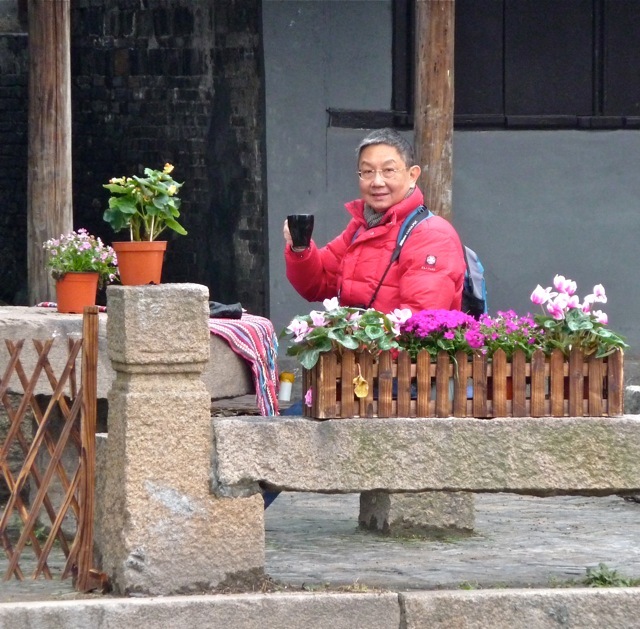 In the populated XiTang town (西塘), I took a rest and enjoyed a cup of coffee by a canal. Interestingly, these flowers are the only flowers in the canal town. I find it curious that Chinese don’t like to plant flowers to decorate their homes and quarters. 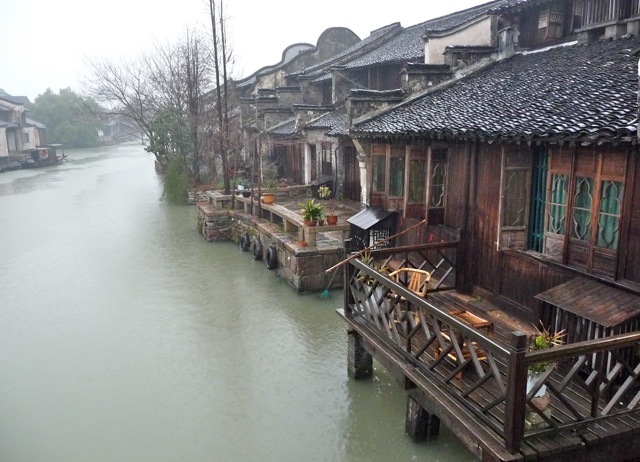 Another canal town WuZheng (烏鎮) was completely different from XiTang. While the former was a lived-in town, WuZheng was a vast Disneyland-like amusement park. A corporation bought the entire old town, relocated the residents, restored the old houses, and made the entire town into one authentic, sanitized, commercial experience. Some houses were converted into riverside inns, while others were changed into restaurants. I would enjoy living in one of these inns for a few days. 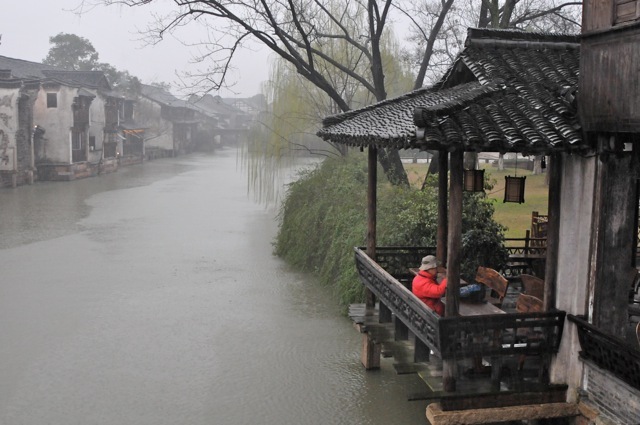 It was raining hard when our tour group visited WuZheng, and the streets and stores were empty of people. But that did not slow down our rapid-fire shutter fingers. I did not miss any opportunity to enjoy a cup of coffee. As the lone customer by a drenched canal, I had an unusually tranquil rest. 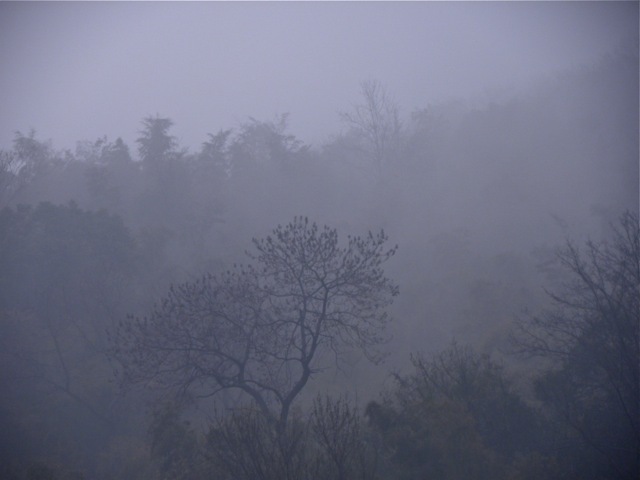 The last stop was Hangzhou (杭州), and it was raining extremely hard. All local and outsider tourists were under umbrellas as they braved the torrent. As it was raining too hard to stroll the garden, we settled for indoor bonsai exhibitions. 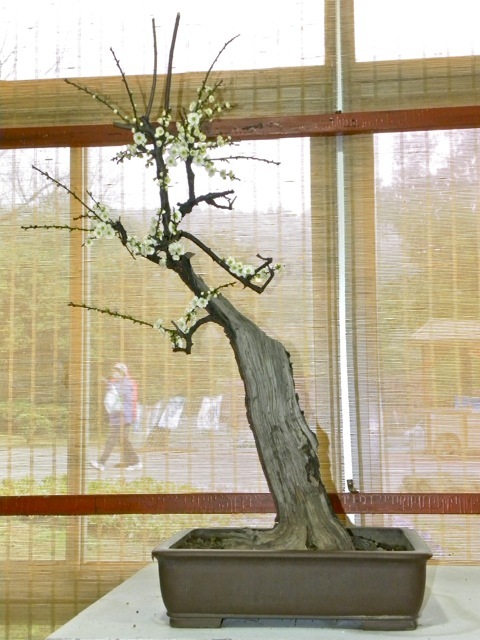 This flowering bonsai plum tree was coaxed from a half-dead trunk. We did find an unusual plum flower in Hangzhou. These rain-soaked wax plum flowers (臘梅) was a surprise for us since they usually bloom during the really cold weather, and should not appear so late in the season. 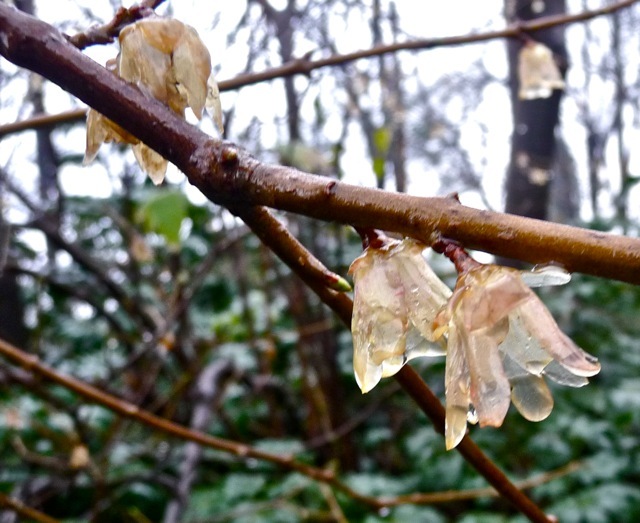 Their translucent petals look like wax; and true to their reputation for hardiness, they seemed to be weathering the rain rather well. 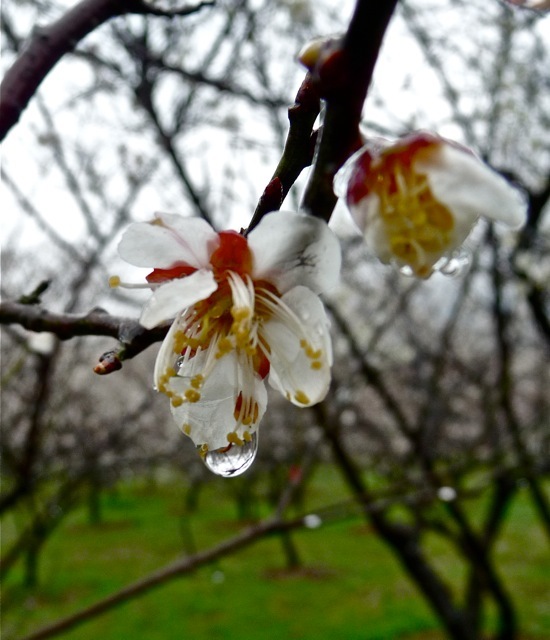 This picture captures our experience viewing the plum flowers: Chilly days, heavy rain, foggy hills, rain drops on branches, and beautiful plum flowers. Posted by Robert Wu on Thursday, July 1, 2010, at 3:51 pm. Filed under Uncategorized. Follow any responses to this post with its comments RSS feed. You can post a comment or trackback from your blog.